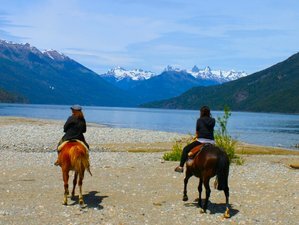 This horse riding vacation will include three nights' accommodation with breakfast included and two nights' camping in the Patagonian Andes mountains. You will enjoy five days of guided rides in and around the stunning Lago Puelo National Park. It's an unbeatable way to see the Andes mountains and to experience first-hand the natural beauty this corner of Patagonia has to offer. Puelo Horse Riding's El Portal del Lago is a small family-run business and as such they have a limit of no more than five guests at a time, guaranteeing a personal and unique holiday experience. They also have all the local knowledge necessary to ensure you have an unforgettable stay. At El Portal del Lago, the accommodation would be in a double, triple, or quadruple ground-floor studio apartment with private bathroom and kitchen. It's fully equipped. It also has Wi-Fi and satellite TV. 14:30 Ride in Lago Puelo National Park: along the River Azul to the lake, and by the shore of the lake. You will then cross the river Azul on horseback and take the mountain trail that goes through the national park towards Chile. This beautiful ride takes you into the native forest of cypress and cohiues to an old settlement on the trail towards the border with Chile. Approximate riding time is three to four hours. 10:00 Horse riding leaving from the establishment. You’ll cross the river ´Azul´ on horseback and follow the river upstream to the home of a local family who lives at the foot of the mountain. Once there, you’ll take a trail which goes up the Motoco Mountain. Light lunch half way up on a viewpoint overlooking the River Azul valley. After a three to four hour ride through the native forest, you reach a small lake known as ´Laguna Huemul´ (so-called after a small deer native to this part of Patagonia). It is a breathtaking place, nestled in a forest of native lenga, notro y ñire trees and with beautiful views of the surrounding summits. You’ll set up camp on the shore of the small lake. Total riding time: 5-6 hours. This riding holiday takes place in and around Lago Puelo National Park. Puelo Horse Riding is situated at the entrance to Lago Puelo National Park, Northern Patagonian Andes, Argentina. Breakfast, lunch, and dinner are included. Dinner on the first night is typical barbecued Argentine "asado" including beef or lamb, vegetables, salads, and beverages. Vegetarians are catered for. Please inform Puelo Horse Riding of any special dietary requirements. Puelo Horse Riding is a small family-run business and they want to provide a personal and unique holiday experience in a stunning natural setting. For this organizer you can guarantee your booking through BookHorseRidingHolidays.com. All major credit cards supported. I would like to receive the BookHorseRidingHolidays email newsletter, including special Horse Riding Holidays offers and giveaways. Show this Horse Riding Holiday to your friends.